Kubotek has decided to join the $99 bandwagon. But don’t get too excited. Kubotek has not done an Alibre. KeyCreator is still priced the same. However, they have slashed the price of their Spectrum CAD viewer from $695 to $99 for a “limited time”. That’s an whopping 85% discount. According to this page, for $99 you can “view, manipulate and print the most popular 2D and 3D CAD formats like SolidWorks, AutoCAD, NX, CATIA V4, Pro/E, IGES, STEP and many others” and “measure and calculate mass properties” (details here). You can also get CATIA V5 support for an additional $599, which normally retails at $2500 (a 76% discount). You can “view” and “print” 3D models using Spectrum. But I am not quite sure what Kubotek means when they say that you can “manipulate” them. After you download, install and fire up the week long trial, you are presented with a help window showing you all kinds of wonderful things like Hybrid Modeling. Don’t bother. That’s the KeyCreator help file aptly titled “Help System for KeyCreator“. The only think I found that I could manipulate was the 3D view. 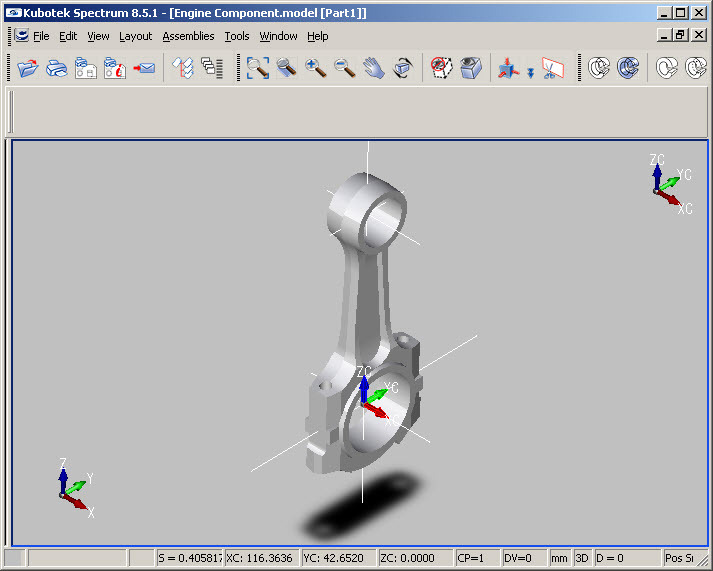 Here is a CATIA V4 model imported seamlessly into Spectrum. I say seamlessly because Spectrum uses Spatial’s 3D InterOp to read CATIA V4 files, which in turn uses authentic CATIA libraries from Dassault Systemes itself, not some reverse engineered libraries. So you can be pretty sure is that what you see in Spectrum is precisely what the CATIA user designed in CATIA. In fact, Spectrum uses Spatial’s 3D InterOp libraries to convert almost all the supported 3D formats (neutral as well as proprietary) to ACIS, the modeling kernel used by Kubotek, which is then finally displayed to the user. However, the 3D PDF reader was a bit of a disappointment. The 3D data in a 3D PDF file can be of two types: PRC and U3D. Apparently Spectrum can read only those 3D PDF files which stored the 3D data in U3D form and not PRC. This means that all the wonderful 3D PDF files that Adobe recently uploaded here cannot be viewed in Spectrum. But then you always have the free Adobe Reader for that. And speaking of PDF, here is the best part. Spectrum can create 2D as well as 3D PDF files. So this means that if you want to publish 3D PDFs from your 3D models you do not need to spend $699 to buy a license of Adobe Acrobat Pro Extended. The $99 Spectrum will do the job just fine. However, note that the 3D PDF’s created by Spectrum does not hold the actual NURBS solid model. Rather it contains a mesh representation which is probably what you want when distributing your 3D data to others as 3D PDF files. Bottom line, I would say that this is a good deal. Why? You get to view, measure and verify a bunch of proprietary and neutral formats and even create 3D PDF’s from them. All this for just $99.